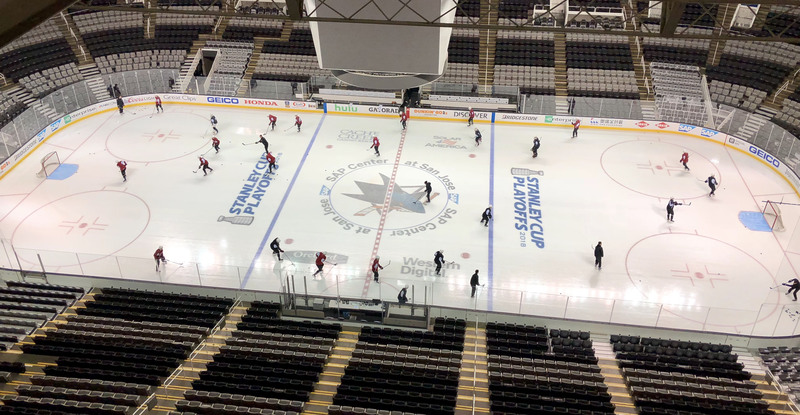 Good morning from the SAP Center in San Jose, where the Roadrunners assembled for a morning skate ahead of tonight’s playoff opener, which is scheduled for a 7:00 PM start. Tucson, playing its first postseason game in franchise history, will also be playing the first of such by an Arizona Coyotes American Hockey League affiliate since May 2, 2015, when the Portland Pirates fell to the Manchester Monarchs by a 5-3 count in the series’ fifth and deciding game. 10 players on the Roadrunners’ active roster enter the night with prior Calder Cup playoff experience. There are many others, which is often the case in the AHL, that will be making their professional postseason debuts. Andrew Campbell (55), Pierre-Cedric Labrie (49), Carter Camper (42), Tye McGinn (22), Mike Sislo (18), Joel Hanley (9), Trevor Murphy (6), Mario Kempe (3), Derek Army (3), and Zac Larraza (2) combine for 209 games AHL playoff experience. Both clubs come into the evening having won a combined nine-straight games. The Barracuda finished the regular season with a 20-12-1-1 record on home ice; they have not suffered a defeat as hosts since March 24 – a run of four consecutive victories that began during Tucson's past visit. The Roadrunners posted a 2-2-0-0 record in their four regular season visits to the SAP Center. Lawson Crouse’s goal on March 25 in the Roadrunners’ previous game in San Jose was the start to a streak he finished the regular season with – points in eight consecutive games. We’re feeling good, but it’s one of those situations where you don’t want to feel too good. In saying that, we’re confident in our group here, we know what we’re capable of, and it’s just about execution at this point. I think they won six games in a row to end the year and to make it into the playoffs. They’re a hungry team, they’re going to be coming out with all they have, and obviously they have some good mojo going right now, but so do we, we finished the year strong. It just comes down to execution; we know that they’re going to come ready to play at 7, and so are we. I think in any playoff series you just want to take it game-by-game. You can’t think too far forward. When something bad happens, you’ve got to bounce back. It’s playoff hockey, things aren’t always going to go the right way, and it’s how you overcome it – and I think we have a group that can do that very easily. We gel together really nicely. We have some older guys that have the [playoff] experience and we have some younger guys that are very hungry. We have a very willing group in are room, and now it’s about doing it.